We proudly gave a couple of camera bags to Nick H today, who was visiting London for a few days, before returning to work in Hong Kong. He’ll be letting us know when and where he drops the camera bags. Remember, if you want to create your own bag, you can email us here, and we’ll give you the instructions. It is really very simple, and takes nothing more than purchasing a disposable camera, finding a freezer or small transparent plastic bag, and a bit of willing. Camera 12 – A woeful/wonderful tale. So here’s how an unfortunate combination of overthinking, bad luck and heartbreak led to the disappearance of the camera you entrusted to me. When I first got the camera I was determined to put it somewhere really clever and funny, so you’d write about it on the blog and I’d look really clever and funny. A boat party wasn’t good enough. A trip to Berlin wasn’t good enough. A ride on the London Eye certainly wasn’t good enough. And whilst I deliberated the camera sat in its bag with its ‘PICK ME UP’ postcard on my kitchen table. For weeks. And then, without warning, it went missing. Now this was potentially rather embarrassing. Suddenly I wouldn’t look clever and funny, I’d look like an idiot who lost his camera. So rather than dealing with the issue, for four consecutive weekends I spent an hour vaguely poking about the house, rechecking all my shelves and under the sofa and scratching my head. On the fourth weekend of doing this my housemate found me mid-scratch and asked me what I was doing. ‘I’ve lost a disposable camera in a plastic bag’. ‘Oh I’ve got it’ he said. ‘It told me to pick it up, so I did. And then took some photos with it, of my feet’. So it was back in my possession and I now knew I had to get rid of it fast. As luck had it I had just got back together with my exgirlfriend who was about to go on holiday to Galicia for a week. Seizing my chance (not clever or funny but at least foreign) and buoyed by refound love I gave her the camera and asked her to drop it somewhere good whilst abroad. She dutifully left for Spain, and then, bingo, as soon as she landed back on home shores, we promptly split up again. Since I was rather preoccuppied with my heart being smashed into thousands of pieces I failed to enquire about the camera and I haven’t spoken to her since. So I have no idea if she dropped the camera in Galicia or whether it came back in her bag to her bedroom on the Holloway Road, two short agonising miles from my house. Wherever it is, just promise me that if you get a camera full of pictures of my exgirlfriend in union with a Spanish coastguard you won’t tell me. Thanks. Sorry. Are you able to put a ‘probably’ tag somewhere over Galicia? Thanks Peter, although sorry for the turmoil we’ve obviously put you through. You can follow Camera 12 at its very own page, or on the tracker. Camera 5, which was dropped off in Berlin by Kirsty S, has been found! “I got the camera no. 5 at Starbucks Kochstr. and brought it to Lisbon/Portugal. Wonderful, massive thanks to Janosch for letting us know about the camera and its movements, and congrats to Kirsty for being the dropper of the camera which had its first result. We’ve updated the tracker page so you can see Camera 5′s current location, as well as giving Camera 5 its very own page so you can keep up to date with its movements. By our calculation, it has travelled approximately 2000 miles (London → Berline → Lisbon) already! 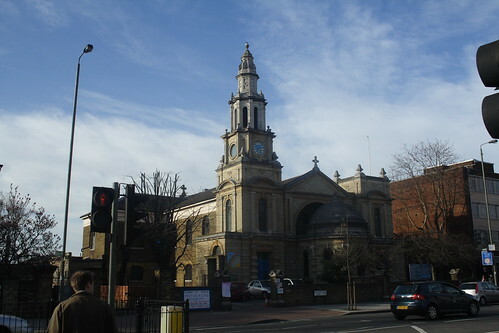 St Mary’s Balham, originally taken by Matthew Black, and the view from The Nightingale – location of today’s camera drop-off. I sent out Camera 11 today. With the first ten cameras, we’ve pretty much ‘left’ them out in the open for people to pick up, and of the ones i’ve checked for, they’ve all disappeared. Now either they’ve been removed and binned, or been taken care of by someone lovely who just hasn’t contacted us yet. Whilst this approach is the purist method, for the next ten or so cameras, I’m going to try a slightly different tack, and see which format seems to work best (I have my suspicions!). Today’s camera was handed to Chris T. whilst I was meeting up with him for a coffee in Balham (you may have figured out by now where I live). I explained the concept of the project: take a few pictures, then pass it on; but added this: “When you pass it on, explain what to do, and most importantly, mention the website”. I’m hoping this word-of-mouth explanation of visiting the website when you’re given a camera will help increase the response rate. I’m going to do this for a few cameras and see if we get quicker returns or even just a mail to say someone gave them a camera. Whilst I love the idea of not seeing a camera for a year, and then it turning up, the cynic in me can’t help thinking they’ve just been lost forever – but this project isn’t about quick turnaround or immediate gratification. I must curb my impatience!